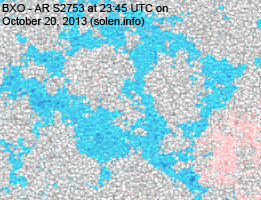 Last major update issued on October 21, 2013 at 05:30 UTC. Updates are likely to be irregular or very late until October 25. 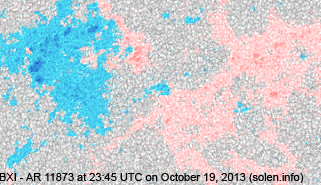 The geomagnetic field was very quiet on October 20. 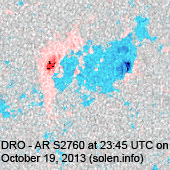 Solar wind speed at SOHO ranged between 270 and 367 km/s. 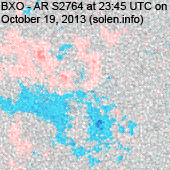 Solar flux measured at 20h UTC on 2.8 GHz was 133.4 (increasing 25.6 over the last solar rotation). 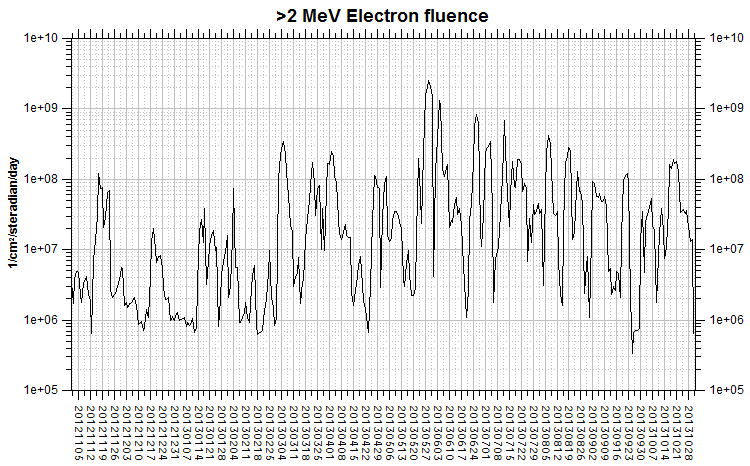 The 90 day 10.7 flux at 1 AU was 113.3. 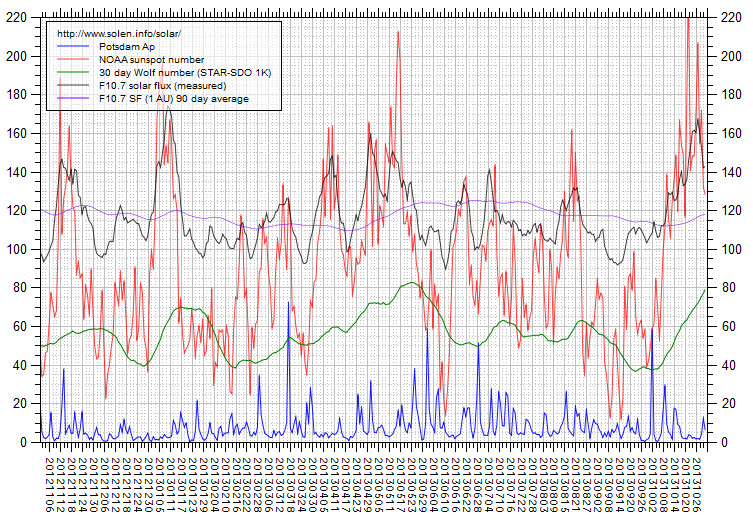 The Potsdam WDC planetary A index was 2 (STAR Ap - based on the mean of three hour interval ap indices: 2.0). 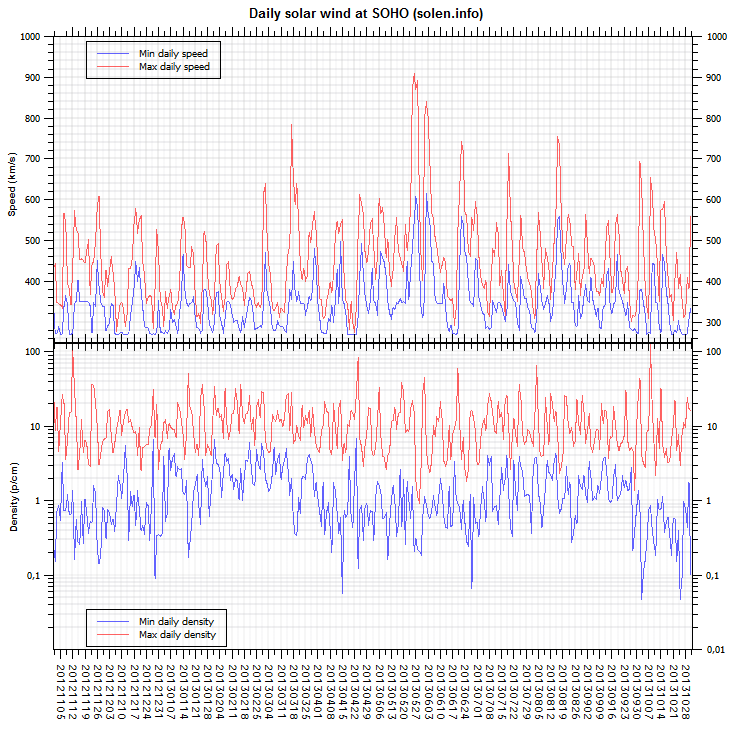 Three hour interval K indices: 00000001 (planetary), 00012211 (Boulder). 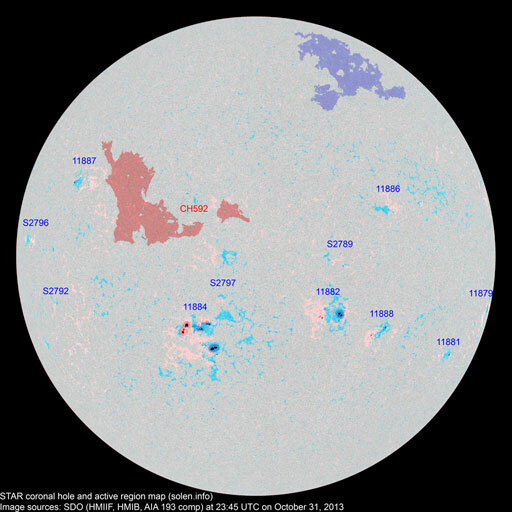 At the time of counting spots (see image time) spots were observed in 11 active regions in 2K resolution (SN: 247) and 9 active regions in 1K resolution (SN: 149) SDO images on the visible solar disk. Region 11869 [N20W30] reemerged with penumbra spots. 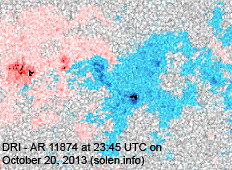 Region 11871 [N14W13] reemerged with a penumbra spot. 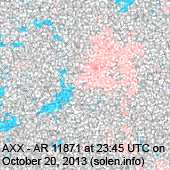 Region 11872 [S17E03] was quiet and stable. 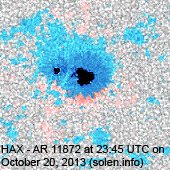 Region 11873 [N11E10] developed slowly and quietly. 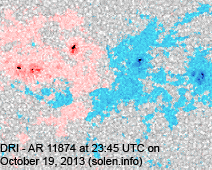 Region 11874 [S11W17] was quiet and stable. 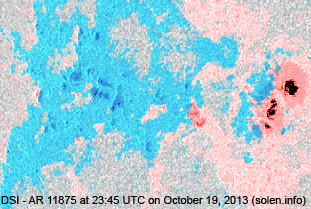 Region 11875 [N07E32] gained spots and penumbral area. 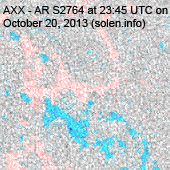 The region has weak polarity intermixing. 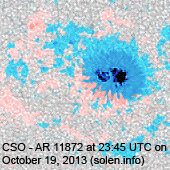 Region 11877 [S12E53] developed slowly and was mostly quiet. 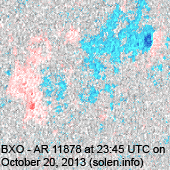 New region 11878 [S10W53] emerged on October 14 and was numbered by SWPC 6 days later. S2753 [N17W13] decayed slowly and quietly. S2764 [N22W42] decayed slowly and quietly. 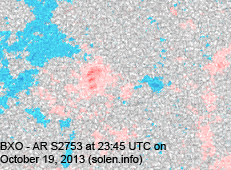 S2769 [N13E26] reemerged with penumbra spots. 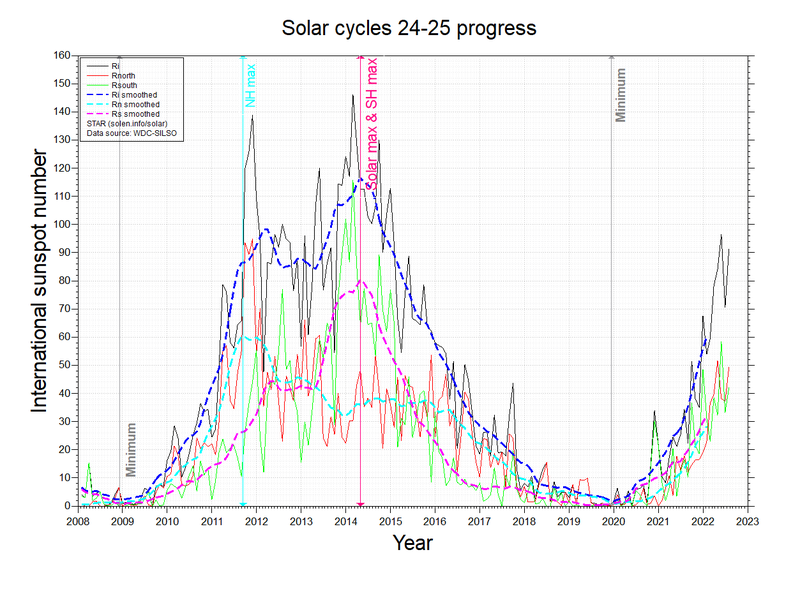 October 18-20: No obviously Earth directed CMEs were observed in LASCO and STEREO imagery. 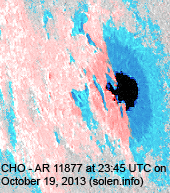 A recurrent coronal hole (CH591) in the northern hemisphere rotated across the central meridian on October 17. 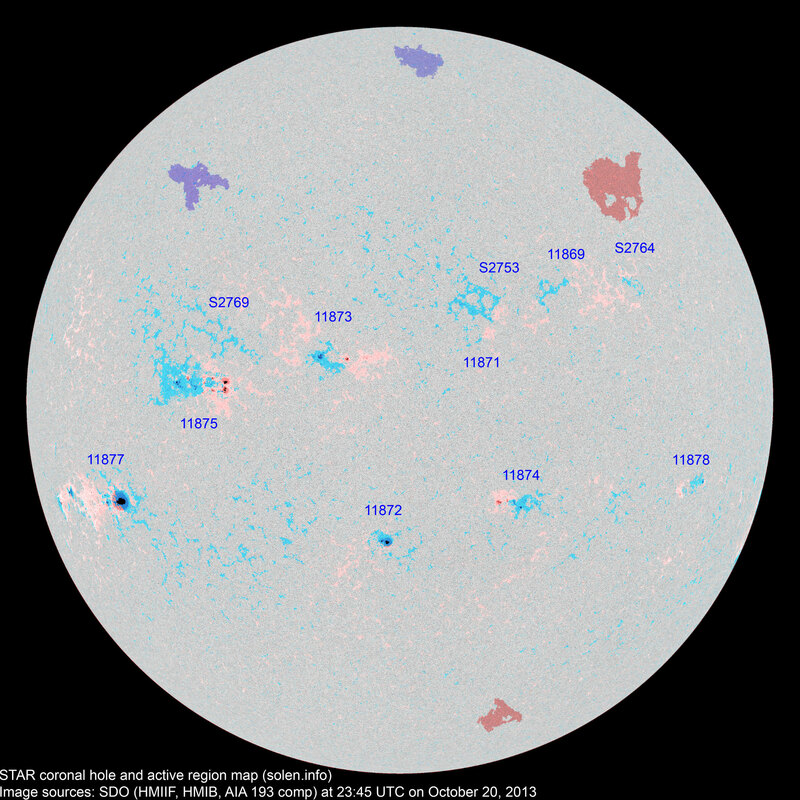 CH591 may be too far to the north to cause geomagnetic effects. Long distance low and medium frequency (below 2 MHz) propagation along paths north of due west over high and upper middle latitudes is good. 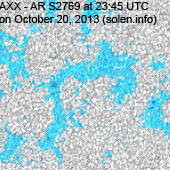 Propagation on long distance northeast-southwest paths is fair. 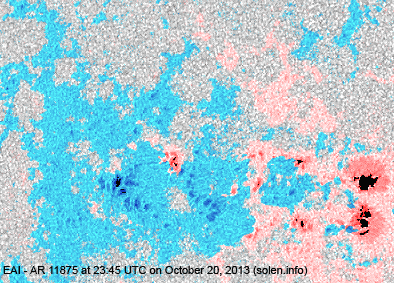 The geomagnetic field is expected to be quiet on October 21-23. 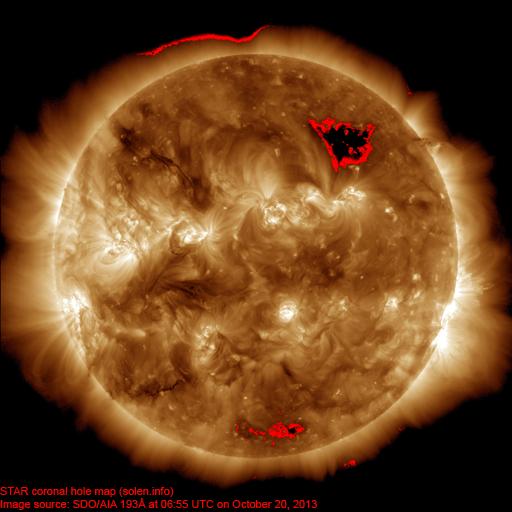 There's a chance of weak coronal hole effects and quiet to unsettled conditions due to CH591 on October 21.